Request Pricing at the bottom of the page. The AMG Driver’s Package for the first time allows increasing the electronically limited top speed in the new E 53 models to 130 mph. 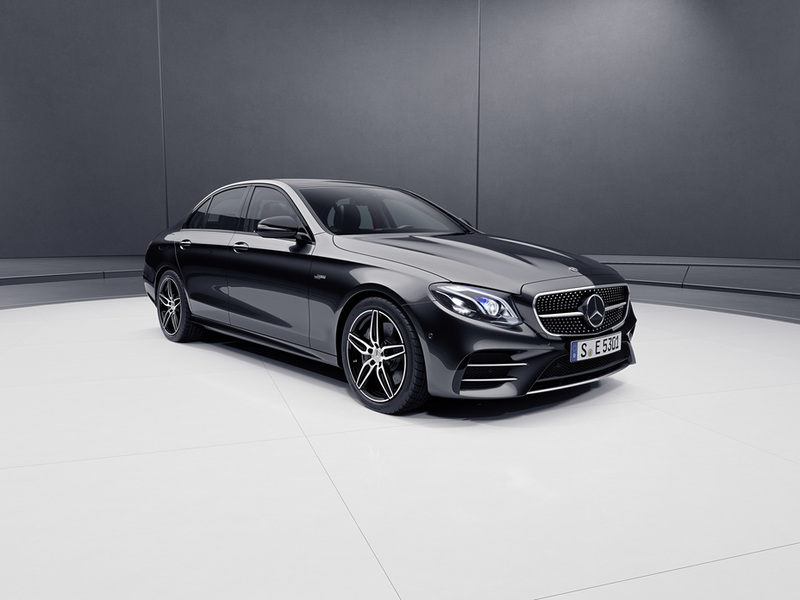 The standard AMG Sport Braking system was adapted to the added power and performance: The front axle features cross-drilled and vented 14.2″ brake discs with four-piston fixed callipers and AMG lettering, the rear axle is fitted with 14.2″ discs with single-piston floating callipers. The standard Widescreen Cockpit includes a large display with virtual instruments in the direct field of vision of the driver that serves as the instrument cluster, as well as a 12.3″ central display above the center console for the infotainment system. Visually, the two displays under one shared glass cover blend into a Widescreen Cockpit and consequently emphasize the horizontal orientation of the interior design. The new, standard-fit AMG Performance steering wheel in black Nappa leather with red 12 o’clock marking offers extensive individualization options such as DINAMICA or Black Piano Lacquer trim. Many functions such as Active Distance Assist DISTRONIC can be activated with the controls in the horizontal steering wheel spokes. The touch-sensitive Touch Control buttons respond to swiping motions and enable the driver to control the entire infotainment system without having to take his/her hands off the steering wheel. The new 3.0-liter in-line engine is coupled with the AMG SPEEDSHIFT TCT 9G transmission, which impresses with extremely short shift times, fast response to shift paddle commands, a double-declutching function and multiple downshifts. Whether automatic or initiated by the driver using the steering wheel shift paddles, upshifts or downshifts are implemented instantly. Especially in the “Sport+” and in manual driving modes, the transmission is very responsive. With the five DYNAMIC SELECT drive modes “Eco,” “Comfort,” “Sport,” “Sport+” and “Individual,” the driver can tailor the characteristics of the new 53-series models even further to suit personal preferences at the press of a button. The available range extends from efficient and comfortable to very sporty. This modifies key parameters, such as the response of the engine, transmission, suspension and steering. Independently of the DYNAMIC SELECT drive modes, the driver has the option of pressing the “M” button to switch directly to manual mode, in which gearshifts are executed exclusively using the shift paddles on the steering wheel. The suspension set-ups can also be selected specifically as needed. The damping at each wheel is adjusted to suit the current driving situation and the condition of the road. This is done rapidly and precisely, using two separate valves for the rebound and compression forces in the dampers. The damping characteristics can also be preselected in three modes, “Comfort,” “Sport” and “Sport+,” allowing a significantly more noticeable differentiation between excellent long-distance comfort and sporty driving dynamics.